This illustration shows an artist's impression of an X-ray bright pulsar in a binary system with a low-mass star as a companion. When the gravitational pull of the pulsar – which is a very dense object – starts drawing matter from the companion star, the pulsar starts accreting matter via an accretion disc, and emitting X-rays. This emission, supported by the accretion process, is shown as wide, white beams. As the pulsar accretes matter, it also gains angular momentum and its rotation becomes faster. 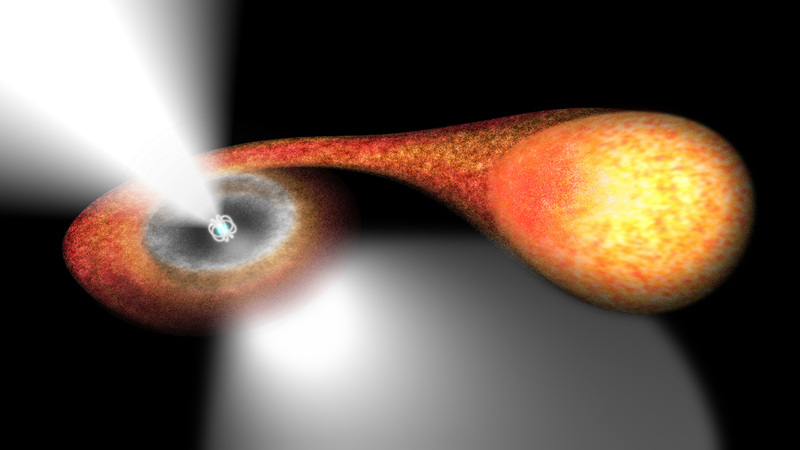 Astronomers believe that accretion in a binary system is the mechanism responsible for speeding up millisecond pulsars, which are known to spin much faster than expected for their old age.